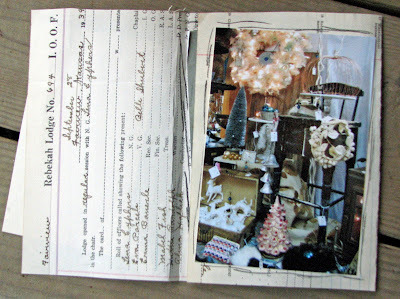 At the scrapbook layout swap that I went to Saturday, many of the ladies were so more organized and prepared than I was. Most of them had brought pictures to add to the layouts that were being swap... Not me! 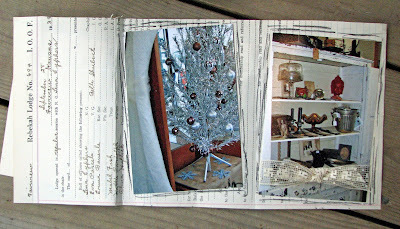 This time, I wasn't as organized so I took that time to work more on my Silver Bella Journal. Here are just a few pages that I got finished.... I just love doing this journal. It gives me the freedom to play and experiment with new things: layering vintage papers, using charcoal pencil and using bits and pieces of things I have collected. The beautiful embossed envelope was from a beautiful thank you card that Stephenie had sent me. 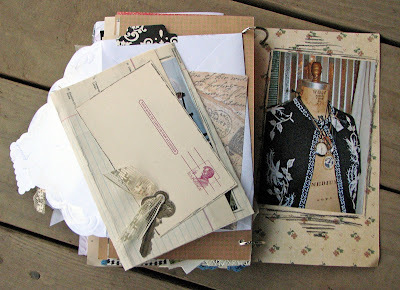 I had saved it just knowing that I loved the embossed envelope flap and knew I could put it to use somehow. Now I have a reminder of a dear blogging friend in my journal. I just love using things that mean so much. Tucked inside of the envelope is a mini album filled with pictures from my adventures to Rusty Chandelier. These pictures are a sweet reminder of all of the fun and lovely treasure that we found. 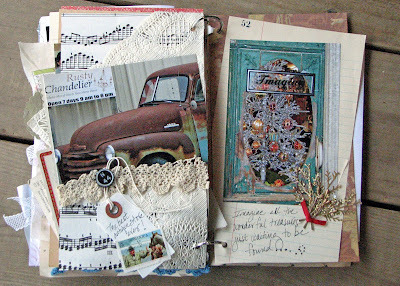 I am so glad that I wasn't as organized, so I could play and add some more pages in my journal. Sheila, I love this journal! 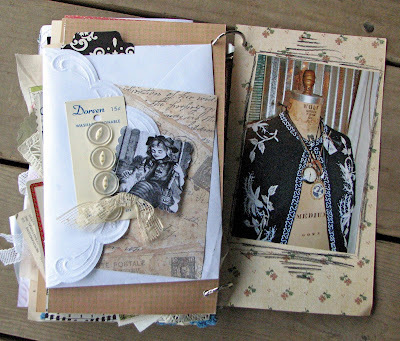 I have always wanted to try a altered book journal of some kind. Yours is lovely and looks like you had great fun!!! BTW, for all your kindness to me..I left you a little something on my blog. Go check it out! What a wonderful way to store your memories! It looks like a creative feast for the eyes! That's a beautiful journal Sheila!!! wow this journal is GORGEOUS!! I love all the little bits you have tucked here and there. It's amazing Sheila! I love all the bits and pieces you included! It is so beautiful!!! It is fun to just mix and match and see what you come up with.